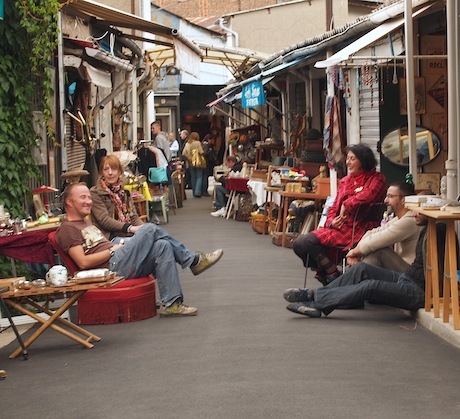 Officially just North of Paris and situated close to the Mairie-de-Saint-Ouen metro station, the huge Saint-Ouen Flea Market (Le Marché aux Puces de Saint-Ouen) is one of those Parisian institutions that you might not read about in the guide books. It’s located in an area considered relatively troublesome (you’re on the edge of the city here, close to a number of flashpoints of the car-burning riots of a few years ago) and it’s a bit of a trek to get there. But it’s worth the effort in my opinion. The huge indoor/outdoor market bills itself of the largest of its type in the world, regrouping 15 large markets into one enormous market. 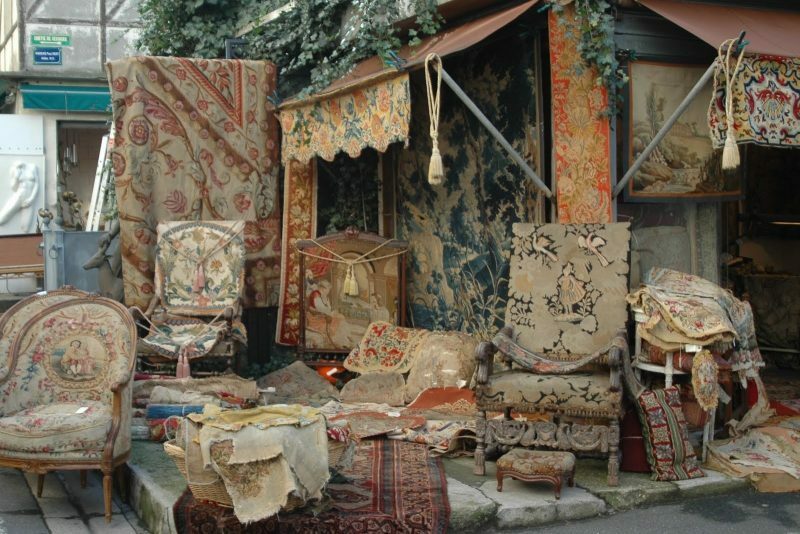 It is a place where you can find all manner of fascinating items laid out for your browsing pleasure by the warehouse-load; it’s a shabby-chic paradise of trinkets, artwork and decorations from the past – truly a real treasure trove. 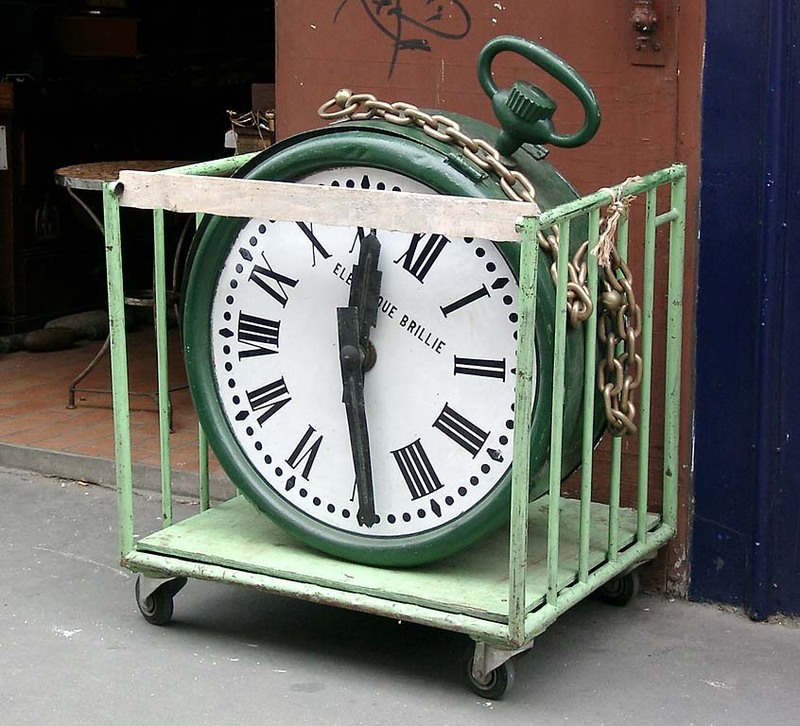 I first heard about Saint-Ouen Flea Market about six years ago when I was on a visit to Paris with my wife. We were in the Pigalle area and my wife had just had her wallet pick-pocketed in the metro station of Abbesses (fans of the film Amélie will be familiar with it). We were licking our wounds and using some of the cash that the thief didn’t get in a nearby brasserie. The bar owner tutted loudly and told us that this was, unfortunately, a common occurrence and that there existed a huge market where all the stolen items of the city were openly traded under the very noses of the authorities. It was a place not far from here, he said, called Le Marché aux Puces de Saint-Ouen and that will be €7.50 each for those small beers, please. The great flea market isn’t all stolen goods, of course, but like any open market where there’s a constant demand, there is a certain amount of stolen booty amongst the correctly-sourced stock. Contrary to our barman’s assessment of the situation, the authorities do care about this phenomenon and there is a special under-cover police force dedicated to the task of recovering stolen items of value. As the grills are raised on a normal day’s business at 7:30am, the huge crowd from the four corners of France and beyond disperse amongst the stands, hunting for something special – an elusive bargain. But amongst the crowd, a much smaller subgroup is on the hunt for treasure of a different kind. Four undercover agents from a specialist branch of the Gendarmerie (the “stolen items of artistic value” detail, or OVNAAB / Objets volés de nature artistique d’antiquité et de brocante) are on a search-and-recovery operation that may go some way to addressing the injustice that such an open market presents for the dishonest. The treasure-seeking gendarmes get to work with the maximum of discretion. One of them suddenly thinks he has something: he seems to recognise a valuable pendant that was stolen a few months previously in the Paris region. He quickly takes a photo of the object with his mobile phone and emails it to his colleagues back at base. As soon as the sub-officer gets the photo of the suspect item from his colleague in the field, he connects with the Judex database which has some 60,000 objects stolen from all over France. If he wants, he can also run the photo through the Treima database at the Central Bureau against the Traffic of Stolen Cultural Objects (OCBC). It has a database of 90,000. If necessary, he can extend his search to the services of Interpol and its 40,000 references. In any case, it doesn’t take long to confirm. The pendant, as suspected, is the stolen one. For the stall-holder, his worries have begun in earnest. If his livre de police (police register) in which he is obliged by law to record all his purchases, doesn’t substantiate that the item was bought in good faith, he runs the risk of a prison sentence and a very large fine. At the same time over in nearby Rosny-sur-Bois (in the Department of Seine-Saint-Denis), the rest of the group or on high alert. A gang of church robbers was recently broken up and several statues discovered in their treasure horde are of great interest to the investigators. In fact, even if these elite gendarmes are often found rooting around in the field – in the large flea markets, jumble sales and auctions – their principal focus of activity remains in the documenting and valuing of items. View Larger Map The Saint-Ouen Flea Market is open every Saturday, Sunday and Monday from 10:30 to 17:30 (with an hour’s lunch break). For further details, click here to see their website. Next Next post: All Aboard – On Yer Bike!